The stylish NM-based restaurateur has branched into retail and exported her brand to Austin. Is this only the beginning? Above: The Nutty Pear-fessor salad is served at Vinaigrette, her restaurant next door to her Modern General. 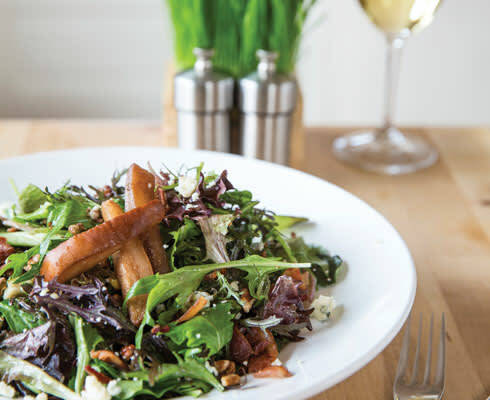 It’s made with grilled Bosc pears, bacon crumbles, toasted pecan halves, and tangy Maytag blue cheese, served with tender greens and ruby port vinaigrette. Wade at Modern General, her newish Santa Fe shop/café. ERIN WADE DOESN’T DO GREEN CHILE. This tends to raise eyebrows for a couple of reasons. First, because as a restaurateur she’s built a budding empire out of the way we eat, or wish we ate, in 2016: If it’s green, organic, and locally grown, you’ll likely find it in her kitchens. 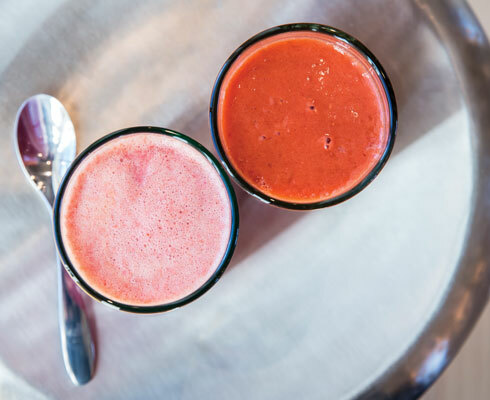 At salad-centric Vinaigrette, which just opened a third location in Austin after building a devoted following in Santa Fe and Albuquerque, you can gobble up a garden’s worth of kale, cabbage, or peppers of the bell variety, yet there’s nary a Big Jim in sight. Next door to the original Santa Fe Vinny, at Wade’s new restaurant/retail mashup Modern General, I’m savoring the flecks of fresh mint in my fruit salad and straining to hear over the whine of leafy greens getting mulched into smoothies as Wade reveals reason number two you might expect her menus to have a little more regional kick. True, she wasn’t born here all her life, as the saying goes. And her vintage tweed Yves Saint Laurent jacket would look more familiar in New York or Milan, both of which she’s called home. But New Mexico has been more than incidental to Wade’s success. 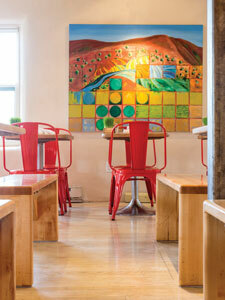 The interior of Vinaigrette in Santa Fe. Wade making kolaches from her grandmother’s recipe. 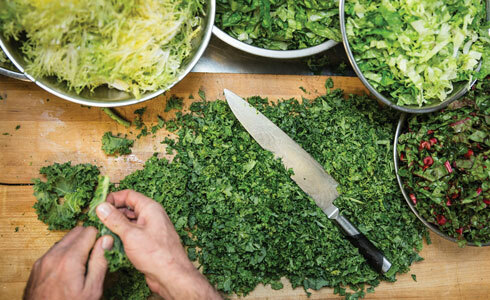 Frisée, lettuce, chard, and kale, a few of the many greens used in the salads at Vinaigrette. Style is one thing Wade’s not short on. The table next to ours at Modern General is a weathered stump that adds a nice rustic touch to the high-ceilinged, vaguely Scandinavian room. Wade’s red wellies, which she wore to town from the farm this drizzly morning, look coordinated with the retail display behind her head, where Carl Jung’s Red Book is improbably paired with an arrangement of binder clips in a matching hue. “Nothing you don’t need” is the store’s motto, though a more accurate one might be: Nothing that would look out of place in an au courant gardening-food-lifestyle magazine called Modern General. Taste is important to Wade’s businesses in more ways than one. Her transformation from novice agriculturalist to Martha Stewart for the new millennium began, to her dismay, in a repurposed taco truck. At 25, with a couple of harvests under her belt, Wade started dreaming of a restaurant based on the salads she’d been creating on the farm. Again she hit the books, this time teaching herself to write a business plan, but she found investors reluctant to bite on a would-be restaurateur with no experience in the industry. So she fixed up an old food truck and set about proving to everyone—herself included—that Santa Fe’s taste for wellness could hold its own against the city’s appetite for enchiladas. In 2008, Vinaigrette found its first permanent home a few blocks southwest of the Roundhouse. The restaurant learning curve was steep, but by 2012 Wade was ready to expand to Albuquerque, where Vinny number two opened just west of Downtown, on Central Avenue. The culinary counter programming turned out to be a surprisingly easy sell. Wade’s fresh aesthetic didn’t hurt, either. 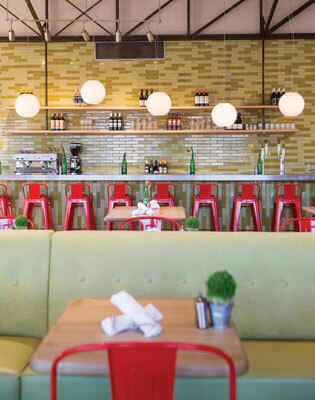 Customers flocked to eat seasonal, organic salads in a place where drinks were served in mason jars but the décor was modern, all blond wood and polished metal, for an experience that was somehow hip and homey at once. In warm weather, diners spilled out onto the Albuquerque restaurant’s ample patio, while Santa Fe swelled with tourists who pleaded with Wade to bring a Vinaigrette to their hometown. One name she heard with increasing frequency was Austin. The upbeat décor of Vinaigrette on Central Avenue in Albuquerque. With the opening of the first Vinaigrette in Texas this winter, Wade’s cultural exportation program has begun in earnest. “Austin’s an awesome city, but it’s very aware of it right now. No one thinks that cool stuff is happening outside of certain hubs in America. And I’m like, there are really smart, incredible people in New Mexico,” she says. Her staff bring the state’s ideas and talent with them—but not the one ingredient customers come looking for when they find out where the restaurant was born. So why no green chile? Wade shrugs. “It’s almost a cliché,” she says. Delicious, sure, but it’s everyone’s style, not her own. It’s the same reason she’d rather try out new business ideas than push for some national mega-chain. “I don’t want a bajillion Vinnies. I’m not willing to sand off all the rough edges,” she says. In a corner of Modern General, an employee is cranking a flour mill by hand. One by one, people come in from the cold to start their day the way Wade has envisioned it, with a light, nutritious breakfast and some craic at the long community table. As she’s speaking, the clouds part a bit and suddenly the room is flooded with light, the way it was designed to be. Wade breaks into her luminous smile. It’ll be a sunny drive back out to the farm. —Contributor John Muller is a writer-in-residence at El Zaguán, in Santa Fe. Smoothie from Modern General in Santa Fe. Makes 2 large portions or 3 medium ones. Combine in blender and blend until smooth. Adapted from Genius Recipes by the Food52 peeps. Serves 4. Rub or cut off any remaining leafiness on chard stems; trim to equal 6" lengths. Blanch in large pot of salted boiling water, 2 minutes at a time in 2 batches, and plunge into ice water to stop cooking each time. Toss chard stems in oil, salt, and pepper. Grill on a charcoal or gas grill over low heat until soft and a little charred in places, at least 10 minutes. Remove from grill and toss stems with anchovy sauce (to taste) and a squish of lemon, and top with grated Parmesan. Mix in blender or processor till smooth. A staple at Modern General and a Seasonal Salad at Vinaigrette. Serves 4–6. Combine all ingredients in a large stainless- steel bowl, toss to combine. Reserve some feta and tomatoes to garnish the top of the salad before serving. Rinse the quinoa like crazy in a strainer to remove bitter-tasting saponins on the surface of the grain. If you are using a sprouted quinoa, you don’t need to do this—it has already been rinsed. Heat olive oil in a pan and add quinoa,let dry out and then toast—you will smell nutty deliciousness pretty quick. Stir to desired level of toastedness. Add water or chicken stock, and salt, bring to a boil. Turn down to a simmer, cover and cook for 15 minutes or so. Fluff the quinoa with a fork. Mix all ingredients but oil. Slowly add oil, whisking constantly.